Chic glamour from American fashion label Michael Kors. An elegant silver tone dial with rose tone hands and hour markers beautifully complements its sparkling stone set bezel. A stylish two colour bracelet crafted in stainless steel and rose gold-plated bracelet offers a contemporary edge. 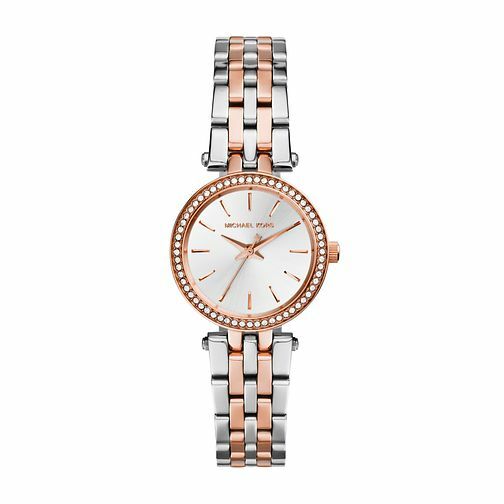 Michael Kors two colour stone set bracelet watch is rated 5.0 out of 5 by 3. Rated 5 out of 5 by Anonymous from Simple yet elegant This is a beautiful watch. It looks a lot better than the photo. I had seen a lot of watches before I made my mind and I am happy with my decision. The watch face is smaller than my usual watches but it's enough to see the time and I just fell in love with it! Rated 5 out of 5 by Anonymous from Lovely pretty watch. I bought this watch today it is so pretty I cant wait to wear it. 20% off too so very happy.